Three Days Grace is a Canadian rock band formed in Norwood, Ontario in 1997. Based in Toronto, the band's original line-up consisted of guitarist and lead vocalist Adam Gontier, drummer and backing vocalist Neil Sanderson, and bassist Brad Walst. In 2003, Barry Stock was recruited as the band's lead guitarist. In 2013, Gontier left the band and was replaced by My Darkest Days' vocalist Matt Walst, who is also bassist Brad Walst's brother. 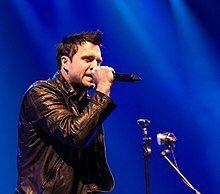 Signed with Jive Records, Three Days Grace has released five studio albums, each at three-year intervals: Three Days Grace in 2003, One-X in 2006, Life Starts Now in 2009, Transit of Venus in 2012, and Human in 2015. The first three albums have been RIAA certified platinum, 3× platinum, and gold, respectively, in the United States, whereas in Canada they have been certified by Music Canada as platinum, double platinum, and platinum, respectively. The band has a string of number one songs on the Billboard Alternative Songs and Hot Mainstream Rock Tracks charts. Three Days Grace has its origins in a five-piece band called "Groundswell", formed in Norwood, Ontario, in 1992. Groundswell released one full-length album, Wave of Popular Feeling. The band's line-up consisted of lead vocalist Adam Gontier, drummer Neil Sanderson, bassist Brad Walst, lead guitarist Phil Crowe, and rhythm guitarist Joe Grant. Most of the members were attending high school when the band formed. By the end of 1995, the band had broken up. In 1997, Gontier, Sanderson, and Walst regrouped as "Three Days Grace". According to Gontier, the name refers to a sense of urgency, with the question being whether someone could change something in their life if they had only three days to make a change. Once in Toronto, the band became acquainted with local producer Gavin Brown. The band gave him several years of material which they had created, and he "...picked out what he called 'the golden nuggets'", according to Gontier. Brown and the band polished the songs, and created a demo album, which they gave to EMI Music Publishing Canada. The record label wanted to hear more material, and with Brown producing, the band created the song, "I Hate Everything About You", which attracted the interest of several record labels. The band was soon signed to Jive Records after being sought out by the company's president. The band moved to Long View Farm, a studio in North Brookfield, Massachusetts, to record their debut album. The self-titled album was finished in Woodstock, New York and released on July 22, 2003. It was met with mixed to favourable reviews. Dave Doray of IGN said of the album, "Mistakes? There's not many." Allmusic reviewer Heather Phares said that on Three Days Grace, "the band's focus and adherence to alt-metal's formulas – coupled with tight songwriting and some unexpectedly pretty choruses – results in a strong tracks that are more memorable than the work of many of their peers". She did criticize the album for its simplicity, concluding, "Three Days Grace are definitely one of the most accessible alt-metal bands of the 2000s; they just need to add some more distinctiveness to their sound." To support the eponymous album, in 2003 Three Days Grace released its first single, "I Hate Everything About You" (the song whose demo had gotten the band its record deal). The song received heavy airplay and rapidly became a widely recognizable song, and was labelled as the band's "breakout hit". After Barry Stock joined as lead guitarist in late 2003, Three Days Grace toured continuously and extensively for nearly two years in support of their major label debut. The album peaked at number nine on the Canadian Albums Chart and number 69 on the Billboard 200, and was certified platinum in the U.S. by the RIAA in December 2004 and double platinum in Canada by the CRIA. The release of "I Hate Everything About You" was followed by two more single releases, "Just Like You" and "Home". About this time, Gontier developed an addiction to the prescription drug OxyContin. After finishing the tour for their first album, the band knew they could not continue with the condition he was in, so in 2005, with the support of his family, friends and band members, Gontier checked himself into the Centre for Addiction and Mental Health (CAMH). While in treatment, Gontier began writing lyrics for songs regarding how he felt and what he was going through in rehabilitation. Gontier successfully completed treatment at CAMH. The band found a place suitable for further songwriting in Northern Ontario, in a cottage where they experimented on, tested, and practiced new songs. After three months at the cottage, they had about finished what would be on their second album. Gontier contributed lyrics about his experiences in rehab; the first single from One-X, titled "Animal I Have Become", features lyrics Gontier had written while getting sober. The second album contained at least four more such songs, including "Over and Over", "Gone Forever" and two more hit songs, "Pain" and "Never Too Late". In a 2006 interview, Gontier said that the album's material was more personal to him than the band's previous work because the material had come out of his experiences with despondence, drug abuse, and rehab, which had constituted the past two years of his life. The album was released on June 13, 2006, (It was guitarist Barry Stock's record debut.) Gontier also performed live by himself at various rehabilitation centres as a "thank you" to the people who helped him get through his addiction, and as an inspiration to others who were also dealing with addiction issues. In these performances, he would play songs such as "Pain", "Animal I Have Become" and "Never Too Late", to encourage and motivate people under treatment to overcome their addiction. Most, if not all, of these solo acoustic performances, called the "Three Days to Change" tour, took place simultaneously as Three Days Grace toured promoting One-X. In November 2006, Gontier performed with the band at a special show at the CAMH in Toronto, where he had gone for his own rehab. The audience, of about 250 people, included patients, radio contest winners, family and friends of the band and representatives from the band's label. Following the performance, Gontier did a 50-minute Q&A session which was filmed as part of the "Behind the Pain" documentary. One-X was met with mostly positive reviews. The Toronto Star complimented the album with a review title of "One CD Worth Buying..." and focused on its lyrics, saying: "The lyrics really speak out to you, especially if you're going through a tough time in your life." Allmusic reviewer Corey Apar praised the music, saying it "remains catchy despite its lyrical darkness", but pointed out that Three Days Grace is "hardly innovative" in their approach to writing music and that "further distinctive qualities" would help the band separate itself "...from their alt-metal peers". One-X peaked at number two on the Canadian album chart and at number five on the Billboard 200, selling 78,000 copies in the U.S. in its first week of release. "Animal I Have Become" was Three Days Grace's most successful single, becoming 2006's most played rock song in Canada. The album helped Three Days Grace to become the number one rock artist in airplay in the U.S. and Canada in 2007, with Billboard ranking them as the number one rock artist of 2007. One-X was certified triple platinum by the RIAA in the U.S. on March 4, 2016, and double platinum by the CRIA in Canada in July 2007. Three Days Grace toured the U.S. and Canada throughout the second half of 2006 and all of 2007 in support of One-X. In early 2008, they toured across the U.S. alongside Seether and Breaking Benjamin. From March to August 2008, and from January to April 2009, Three Days Grace recorded their third album at The Warehouse Studio in Vancouver, British Columbia, and in Los Angeles, again with producer Howard Benson who had worked with them on their previous releases. The album, entitled Life Starts Now, was released on September 22, 2009. Critics as well as band members have noted the album's departure from the angry tone of the band's previous releases into a lyrical style that is perceived as more optimistic. This album reflects the maturity of the band members as they overcome problems such as sickness and death within their families in which they stated, "We had to be inspired by it, but the outcome is this: It’s a new beginning. It’s life starting over.”  According to guitarist Barry Stock, the album's theme centres around "a new sense of freshness" and the idea that "you don't have to be stuck in whatever it is you're dealing with. Whether it's good or bad, it's your choice to make a change". Life Starts Now debuted at number three on the Billboard 200, Three Days Grace's highest chart position to date, and sold 79,000 copies in its first week. The album was met with mostly positive reviews. Ben Rayner of the Toronto Star gave the album a negative review, saying it possesses "no sound of its own, just a shallow range between Linkin Park and Nickelback". According to Allmusic reviewer James Christopher Monger, who gave the album three out of five stars, Life Starts Now "...continues the theme of One-X, Gontier's personal demons, but with a 'hint of sunlight'." He complimented the album, saying it "...treats the well-worn metal themes of anger, isolation, heartache, and redemption with the kind of begrudging respect they deserve, pumping out a competent flurry of fist-bump anthems and world-weary, mid-tempo rockers". The first single release from the album, "Break", was released on September 1, 2009. In support of the album, Three Days Grace embarked on a 20 date Canadian tour lasting through November and December 2009. They co-headlined a January–February 2010 tour of the U.S. with Breaking Benjamin and Flyleaf. Life Starts Now was nominated for "Best Rock Album" at the 2010 Juno Awards, but lost to Billy Talent III. Three Days Grace went on tour with Nickelback and Buckcherry on the "Dark Horse Fall 2010 Tour". They toured with My Darkest Days starting in March 2011. On October 7, 2011, RCA Music Group announced it was disbanding Jive Records along with Arista and J Records, and moving all the artists signed to the three labels to its RCA Records brand, which included Three Days Grace. On June 5, 2012, the same day as Venus' visible transit across the sun, the band announced that their fourth studio album would be called Transit of Venus which was set to be released October 2, 2012. They created an early promotional video that was released on their website, featuring clips of them in the studio as well as footage of the physical transit of Venus. Due to the rarity of this occurrence, they created the slogan, "Some things will never happen again in your lifetime", reflecting both this uncommon occurrence as well as the mood that the lyrics and music would most likely take on. The first single from the album, "Chalk Outline", was released on August 14. On January 9, 2013, Three Days Grace announced that Gontier was resigning from the band. The band described Gontier's departure as being abrupt and unexplained. The departure came just weeks before a co-headlining tour. Gontier explained that he was simply ready to start a new chapter in his life, stating, "After twenty years of being part of an ever evolving band, I have been inspired by life, to move on and to continue to evolve on my own terms." Brad Walst's brother, Matt (of My Darkest Days), replaced him on tour as the lead vocalist. Three Days Grace commenced their 2013 tour in Moline, Illinois. Shinedown and P.O.D. accompanied the band throughout the tour. Matt Walst was the lead singer. A post to the band's official website on March 28, 2014 confirmed he was the new lead singer. Dani Rosenoer, the band's current touring keyboardist and backing vocalist, had also joined the band for the 2013 tour. During an interview on July 19, 2013 with 99.9 KISW in Seattle, Neil Sanderson confirmed the band was currently working on a new album and they had already recorded half of it. He stated, "We're really amped-up about it, it's got a new energy. It's a little heavier, and it's just more aggressive and it's just got this fresh vibe." A new track entitled "Painkiller" was released to US Rock radio stations on April 8, 2014. On June 6, 2014, "Painkiller" reached No. 1 on the Mainstream Rock Charts, which made it the eleventh No. 1 single the band has released. In an August 2014 interview, the band revealed the title of their next single, "I Am Machine", which was released September 30, 2014, On January 26, 2015, it was revealed that the new album will be titled Human. On March 23, 2015, "Human Race" was released as the third single. Human was released on March 31. In early 2015, Three Days Grace toured Europe followed by touring predominantly throughout the United States, and in November 2015 Three Days Grace focused their tour in Canada. Halestorm supported most of the Canadian dates. Another tour of Europe and Russia has been planned for early 2016. On November 18th, 2016, Three Days Grace released a cover of the Phantogram song "You Don't Get me High Anymore." Three Days Grace has been recognized for their musical efforts through several awards and nominations. In 2007, the band was ranked by Mediabase as the top artist in airplay across all rock formats in the U.S. and Canada, and Billboard named them Rock Artist of the Year. Three Days Grace has been nominated for four Juno Awards, including "New Group of the Year" for 2004. "I Hate Everything About You" was nominated for "Best Rock Video" and "People's Choice: Favourite Canadian Group" at Much Music Awards. In 2007, they were nominated for "Best Group of the Year", and their album One-X was nominated for "Album of the Year". The band's first single from One-X, "Animal I Have Become", was Canada's most-played rock song in 2006 and won that year's Mediabase award for the most-played rock song on radio. "Never Too Late" was nominated for "Best Video" and "Best Rock Video"; and "Pain" was nominated for "Best International Video by a Canadian" and "People's Choice: Favorite Canadian Group" at Much Music Awards. In 2010, Life Starts Now was nominated for "Best Rock Album" at the Juno awards, but lost to Billy Talent III. In 2010, "Break" was nominated for "Best Post Production Video" and "Best Rock Video of the Year" at the Much Music Awards on Fuse.tv. "Break" was nominated for "Best Single" and Life Starts Now won for "Best Album" at the Casby Awards. Three Days Grace are nominated for 2016 Juno Award for Group of the Year. Three Days Grace's music has been described as post-grunge, hard rock, alternative rock, alternative metal and nu metal. Their self-titled album mostly uses the sounds of alternative metal and post-grunge. However, on their second album One-X, the band had more guitar solos and a more melodic sound. On Transit of Venus, the band added a few electronic influences. ^ a b c d e f g Sutton, Michael. "Three Days Grace > Biography". AllMusic. Retrieved August 13, 2009. ^ a b Sarig, Roni (January 14, 2004). "New Faces: Three Days Grace". Rolling Stone. Retrieved August 13, 2009. ^ Montes, Michael (2004). "Interview with Adam Gontier of Three Days Grace". Florida Entertainment Scene. Archived from the original on January 16, 2009. Retrieved November 19, 2008. ^ a b c d "Three Days Grace Biography". MapleMusic Recordings. Retrieved August 13, 2009. ^ Doray, Dave (December 2, 2003). "IGN: Three Days Grace Review". IGN. Retrieved August 13, 2009. ^ a b Phares, Heather. "Three Days Grace > Overview". AllMusic. Retrieved August 13, 2009. ^ Wiederhorn, Jon (October 7, 2004). "Three Days Grace Endure Fire, Asbestos for Their Art". MTV. Retrieved October 23, 2009. ^ a b "Three Days Grace Bounds Towards Bigger Venues". Flint Journal. March 20, 2008. Retrieved August 14, 2009. ^ a b Wuensch, Yuri (July 25, 2006). "Three Days Grace cheats death". CANOE. Retrieved August 21, 2009. ^ Garisto, Julie (April 26, 2007). "Rockfest: a sound revision". St. Petersburg Times. Retrieved October 23, 2009. ^ a b Williams, John (June 21, 2006). "Three Days Grace Makes Solid Debut". CANOE. Retrieved August 21, 2009. ^ "Three Days Grace – Three Days Grace". Billboard. Retrieved August 13, 2009. ^ a b "RIAA – Gold & Platinum – August 13, 2009". RIAA. Retrieved August 13, 2009. ^ "P.G. to get Three Days Grace". Prince George Citizen. November 9, 2007. Retrieved August 21, 2009. ^ Wagner, Vit (November 28, 2006). "Saving Grace". Toronto Star. Retrieved October 19, 2009. ^ a b "Three Days Grace Singer Feels the Pain". MSNBC. June 2, 2006. Retrieved August 13, 2009. ^ a b c Lin, Adena (May 31, 2007). "One CD Worth Buying...". Toronto Star. Retrieved August 13, 2009. ^ a b Apar, Corey. "One-X > Three Days Grace". AllMusic. Retrieved August 13, 2009. ^ Harris, Chris (June 21, 2006). "Busta Rhymes Opens with a Bang, Scoring His First No. 1 LP". MTV. Retrieved August 21, 2009. ^ a b c d e f "New'Grace' CD Coming". Peterborough Examiner. August 12, 2009. Retrieved August 13, 2009. ^ "Gold & Platinum Certification". CRIA. July 2007. Retrieved August 21, 2009. ^ Chad (December 7, 2007). "Three Days Grace Plans 2008 Tour". Alternative Addiction. Retrieved August 14, 2009. ^ a b Rogers, Troy (September 21, 2009). "Starting Life Now with Three Days Grace Lead Guitarist Barry Stock". The Deadbolt. Retrieved October 12, 2009. ^ Chad (August 10, 2009). "Three Days Grace Ready 'Life Starts Now'". Alternative Addiction. Retrieved August 14, 2009. ^ a b c Monger, James Christopher. "Life Starts Now > Overview". AllMusic. Retrieved October 9, 2009. ^ Bledoe, Wayne (April 8, 2010). "Three Days Grace Less Angry These Days". Tribune Content Agency LLC. Retrieved October 3, 2014. ^ Caulfield, Keith; Herrera, Monica (September 30, 2008). "Pearl Jam Scores First No. 1 on Billboard 200 in 13 Years". Billboard. Retrieved October 9, 2009. ^ Rayner, Ben (September 22, 2009). "Three Days Grace: Life Starts Now". Toronto Star. Retrieved October 9, 2009. ^ Smith, Jay (December 7, 2009). "Three Days Grace, Breaking Benjamin Slot Co-Headline Run". Pollstar. Retrieved December 7, 2009. ^ "Three Days Grace Nominated for a JUNO Award! | The Official Three Days Grace Site". Threedaysgrace.com. Retrieved February 21, 2011. ^ "Hey Man – You Have To Be a Member to Access That! – Three Days Grace Fan Club". 3dgfanclub.com. Retrieved February 21, 2011. ^ "RCA's New Executive Team Named Under CEO Peter Edge Amid Layoffs (Update)". Billboard. August 23, 2011. Retrieved October 26, 2011. ^ "Radio Industry News, Music Industry Updates, Arbitron Ratings, Music News and more!". FMQB. Retrieved October 26, 2011. ^ a b "Transit of Venus". Three Days Grace Official Website. Retrieved June 5, 2012. ^ "June 5th". Three Days Grace Official Website. Retrieved May 29, 2012. ^ "Chalk Outline". Three Days Grace Official Website. Retrieved June 26, 2012. ^ "Singer Adam Gontier Explains Departure From Three Days Grace". Loudwire.com. January 9, 2013. Retrieved December 4, 2013. ^ "Three Days Grace Frontman Adam Gontier Departs From Group". 97.9 WGRD. Retrieved November 8, 2015. ^ "Singer Adam Gontier Explains Departure From Three Days Grace". January 9, 2013. Retrieved April 30, 2013. ^ Note: After his departure from Three Days Grace, Gontier began a solo career with the "Adam Gontier Solo Tour", with shows on the Ink Life tour and acoustic sets in venues such as Revolver's E-Cig Lounge in Ohio. In 2015, Gontier revealed he was involved with a new project, the supergroup Saint Asonia. ^ "Three Days Grace, Shinedown to co-headline 2013 tour". November 12, 2012. Retrieved February 7, 2013. ^ "We Welcome Matt to 3DG". threedaysgrace.com. March 28, 2014. Retrieved March 28, 2014. ^ "Three Days Grace in the 95.7 The Rock booth at Rock Fest 2013!". YouTube. July 19, 2013. Retrieved December 4, 2013. ^ "Rock Future Releases - Rock Music Radio Songs' Release Dates". All Access. Retrieved October 4, 2014. ^ "Three Days Grace Album & Song Chart History - Mainstream Rock Tracks". Billboard. Retrieved December 10, 2010. ^ "Three Days Grace Interview - Adam Gontier Departure, I Am Machine Single & More". YouTube. Retrieved October 4, 2014. ^ "New Single 'I Am Machine'". Three Days Grace. Archived from the original on 3 October 2014. Retrieved October 4, 2014. ^ "Three Days Grace To Release 'Human' Album in March". Blabbermouth.net. January 27, 2015. Retrieved February 20, 2015. ^ Childers, Chad (February 25, 2015). "Three Days Grace Reveal 'Human' Track Listing + More". Loudwire. Retrieved May 1, 2015. ^ "Blog - Three Days Grace". Three Days Grace. Retrieved November 8, 2015. ^ "THREE DAYS GRACE CANADIAN TOUR - Three Days Grace". Three Days Grace. ^ "EUROPEAN TOUR EXCLUSIVE TICKET PRE-SALE - Three Days Grace". Three Days Grace. ^ "You Don't Get me High Anymore on YouTube". Three Days Grace. ^ "MMVA 04". MuchMusic.com. Retrieved February 21, 2011. ^ Mayer, Andre (March 29, 2007). "Juno What Time It Is?". CBC News. Retrieved October 24, 2009. ^ "Mediabase Announces 2006 Radio Airplay Leaders." (Press release). PR Newswire. December 21, 2006. Retrieved October 24, 2009. ^ "MMVA07 nominees". MuchMusic.com. Retrieved February 21, 2011. ^ "Nominees". The JUNO Awards. ^ Steininger, Adam (August 15, 2013). "The ten shittiest post-grunge bands". Westword. ^ a b c Michael Sutton (July 22, 2003). "Three Days Grace – Biography". AllMusic. Retrieved February 20, 2015. ^ "Three Days Grace to Play Here on St. Patrick's Day". Archived from the original on February 3, 2011. Retrieved October 4, 2014. ^ a b LA Weekly. "The 10 Worst Post-Grunge Bands". L.A. Weekly. Retrieved May 9, 2015. ^ a b "Three Days Grace News". Loudwire. ^ "The Phoenix News – Album Review: Three Days Grace Suffer from Human Error". The Phoenix News. Retrieved May 9, 2015. ^ Van Gelder, Lawrence (22 June 2006). "Arts, Briefly". The New York Times. Retrieved 20 December 2015. ^ "Sony/ATV's chart-topping Three Days Grace writing for new album" (PDF). Music Publisher Canada. Winter 2014. Retrieved 20 December 2015. ^ "GRAMMY SoundChecks: Three Days Grace". Grammy.com. 4 December 2006. Retrieved 20 December 2015. ^ Patterson, Rob (May 4, 2008). "Three Days Grace Lets It All Hang Out". MusicWorld. BMI.com. ^ Melina Robinson. "Review: Three Days Grace Graces the Joint with New Frontman Matt Walst". LasVegasSun.com. Retrieved May 9, 2015. ^ "Top Ten Nu-Metal Bands – Staff Top 10". stylusmagazine.com. Retrieved September 9, 2015. ^ Doray, Dave (2 December 2003). "Three Days Grace". IGN. Retrieved 11 December 2015. ^ "Melodic Net – Three Days Grace – One-X". Melodic.net. Retrieved February 20, 2015. ^ "Transit of Venus Review | Reviews @". Ultimate-guitar.com. Retrieved February 20, 2015.